This super easy baked fish is really delicious and can vary any way you want. I often cook fish this way, pack it in baking paper, add spices, veggies and put it in the oven for 15-20 and done. How easy is that? Today I went for Asian flavors, I added spinach and shiitake mushrooms and served it with smooth potato puree. Prepare 5 pieces of aluminum foil topped with baking paper (big enough to be able to pack the fish and veggies in it). 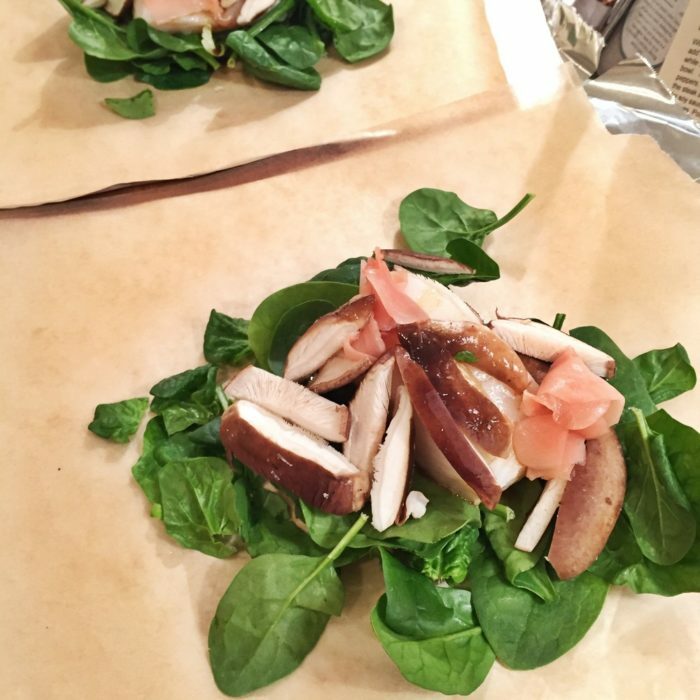 Place a handful of spinach on each, a piece of fish on each and a bunch of mushrooms as well. Mix the soy, lime juice and fish sauce together and drizzle 1-2 tbsp on each preparation. I added some ginger for the adults ( because I love ginger so much) to add a little kick to it. Close the packages and bake for 15-20 minutes at 425F. This works well for a dinner party and you can leave the fish in their packages, it looks great!